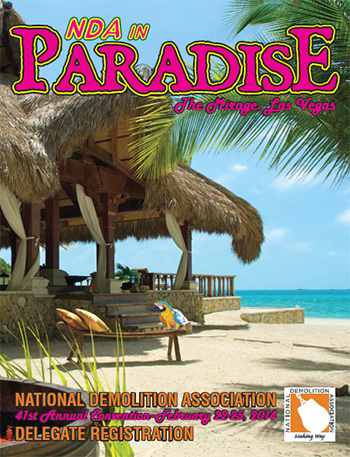 Have you booked your housing for the NDA's 2014 Annual Convention at The Mirage in Las Vegas, Feb. 22–25? If not, now is the perfect time to. The Mirage will be offering a $115 early bird special room rate if you reserve your room by Dec. 31. The contracted room rate is $175 so this is a $60 per night savings. It's possible to love a city without loving all its buildings. That's a lucky thing for Boston, where some of the most notable works of architecture since the 1960s are also the most loathed. As the U.S. looks for ways to rebuild and improve weakening infrastructure, technology solutions offer a means to complete the work more efficiently. That's one of the predictions from a recent report on the nation's infrastructure, which also says public engagement is important to rebuilding efforts. It's the time of the year for construction and materials companies to step back from the daily grind and evaluate the prior year's successes and failures, and to plan for the year ahead. Through this process, it's inevitable that you'll pursue your accounts receivable aging report and feel your stomach churn about the money you earned but couldn't collect. The question is why, and perhaps more importantly, how do you correct it and avoid write offs in 2014? As the United States space program declines, gone are the crowd-captivating shuttle launches and International Space Station trips. And while other countries continue space exploration, much of the infrastructure associated with NASA's previous efforts is being retired, restructured or demolished to make way for new facilities. At the agency's Ames Research Center in Mountain View, Calif., Pantano Demolition tackled the removal of four massive vacuum spheres once used in support of the facility's hypersonic wind tunnel. It faced formidable challenges, but by using a pair of Genesis GXP 990R mobile shears, the company overcame them and redefined the phrase "heavy metal." Collin O'Mara, secretary of the Delaware Department of Natural Resources and Environmental Control, has issued a Notice of Administrative Penalty Assessment and Secretary's Order to River Asphalt LLC for violations of federal and state air quality regulations, as well as its air permit, at the company’s 300-ton-per-hour asphalt plant in Delmar, Del. The order calls for a fine of $13,680 and an additional $2,052 fine as cost recovery reimbursement to the DNREC for expenses associated with the department’s investigation. When good students suddenly lose motivation, parents may threaten to take away the smartphone or the car. When a fantastic team member suddenly begins producing poor work in the office, a manager's first reaction is usually to give him a raise. It's possible to love a city without loving all its buildings. That's a lucky thing for Boston, where some of the most notable works of architecture since the 1960s are also the most loathed. There are the looming twin towers of the JFK Federal Building, the forbidding 1972 addition to the Central Library, the dementedly Seussian Stata Center at MIT, and the Government Service Center, an aggressive concrete behemoth designed by star architect Paul Rudolph. And of course there's City Hall, finished in 1968, which has been called the ugliest building in the world.